Polaris continued its torrid sales pace in the first quarter of 2013 with net sales of $745.9 million, an increase of eleven percent from last year’s first quarter sales of $673.8 million. 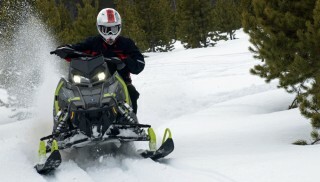 Snowmobile sales totaled $14.7 million for the 2013 first quarter compared to $4.6 million for the first quarter of 2012. The North American snowmobile industry finished the season strong with industry retail sales up over 20 percent in the 2013 first quarter and up mid-single digits percent for the entire season ending March 31, 2013 due to more normal snowfall levels and later snow cover this snowmobile riding season. Polaris’ North American retail snowmobile sales once again outpaced the industry, resulting in increased market share for the season ending March 31, 2013 and four percent lower season-end North American dealer inventories for Polaris snowmobiles. During the quarter, the Polaris introduced eight new model year 2014 snowmobiles, including seven all-new models under the Indy name. Sales to customers outside North America increased over 100 percent in the first quarter 2013 as Polaris moved additional product into the Scandinavian and Russian markets where snowfall levels drove healthy snowmobile retail sales increases.